Anyone that knows me knows that I’m a huge film and TV buff. With movies, I live for B-grade slashers, jungle action films and craptastic science fiction. For TV, I love British comedy, hard sci-fi and light-hearted police capers. Of course, I still line up to watch every new Star Wars film and eagerly anticipate each new episode of Game of Thrones like everyone else. Australia has for the longest time been behind the times in how we make film and television entertainment available to watch. Sure we’ve had QuickFlix for years, but anything recent on that platform costs premium rates outside of your monthly subscription – pass. Newcomers Stan and Presto are offering better services with more content, and international hopefuls Netflix have recently set up shop with their service. Unfortunately, as you can see by this comparison table, not all services offer the same shows. And the shows that people really want (the ones on HBO!) are locked up in Foxtel’s archaic satellite and cable provision. Quickly scanning the above list for the shows I like the most – Game of Thrones, Silicon Valley, Castle, The Walking Dead – will find that they are simply not available. You need to get Foxtel or Foxtel Play at up to five times the monthly cost of other streaming providers to see those. That’s hardly worth it for the handful of decent shows I’m actually interested in, is it? The fact that I have to locate a third party list to see what provider has what shows is itself a joke. It’s not like I can only access parts of the Internet on iiNet and other parts on TPG. I can see all of the Internet with those providers just the same. I can call anybody in the world on Telstra or Optus, and it’s not like I can’t then call a Vodafone customer. It’s not even that bad with downloading music – I can obtain a Metallica album via iTunes, stream it on Spotify; there are a number of choices. I know, I know, it’s all a complicated mess of who owns the rights to television shows. But it shouldn’t be. Why in 2015 we still have regional rights instead of global is a question I keep asking myself but can’t come up with a logical answer to. For those in the know, it is possible to access the Netflix American library of shows which will help matters, but there are those in power who want to make this illegal anyway. Sure I can run out and get a bells-and-whistles blu-ray of Interstellar of Fast and the Furious part 84 (and sometimes I do), that’s no issue. As I mentioned above, I’m the guy that likes to watch trashier films. Films that would never make it to cinema. DVD has always been the go-to place for me to get those films, but as the world is now going streaming it seems that is getting harder to do as well. I wanted to get the latest in the cheesy military action series The Marine, starring various WWE and MMA fighters attempting to become actors. I own the first three parts of the series. Part four has just landed in the US on DVD and Blu-ray. As with the previous instalments, I picked up the local editions to support the local distributors. I have just found out that we aren’t even getting the film out here on DVD or Blu-ray anymore - despite the OFLC classification, it is going straight to Video On-Demand. The problem with that is that it will no doubt cost the same to purchase a digital file as it will cost me to import the disc from the USA! This also recently happened with backwoods slasher Wrong Turn part 6, which performed very well on DVD/Blu-ray in the US but got cast to the VOD wastelands out our way. But it just gets worse. I wanted to check out two new horror films getting favourable reviews – Digging up the Marrow, and From the Dark – both not currently scheduled for local release in any format. But what the hell is this? I can’t even buy these. Amazon want me to sign up to their Prime service for $100 a year that then gives me free shipping and access to their Netflix-style streaming library. 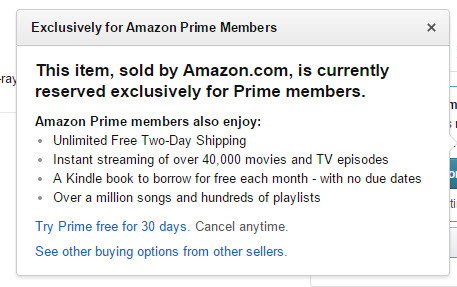 Except that the free shipping is not available to Australia and NEITHER IS THE STREAMING LIBRARY. I would have to pay $100 a year just for the privilege of buying the film I wanted in the first place. And the studios wonder why people pirate. View Previous blog Using PetaPoco with Umbraco is pretty sweet.